Geek Lit Etc. : Manga Monday: Yokoi finally starts fighting back! Hooray for Yokoi! She's finally taking some initiative and becoming an active participant in Seki's back-of-the-classroom antics. In 30th Period, Seki looks a bit different. Oh! He's wearing glasses! Yokoi's never seen him in glasses before. But of course Seki couldn't simply pick out his frames at the optometrist's office; he has to bring a shop's worth of glasses to class with him. Will he finally pick the right ones? 35th Period brings a big snow. Yokoi heads to school early, to make sure she isn't late, and she sees Seki playing the oddest game. He has a little bunny made of snow, and places it in the middle of a pond...and then starts breaking up the ice around it! How cruel! Will Yokoi be able to rescue the poor snow bunny? But perhaps Yokoi's most stressful experience in class comes during 40th Period. In Japanese schools, bringing superfluous items to class, such as CDs and toys, is strictly forbidden. Of course, Seki doesn't take the class' surprise bag inspection seriously, but the robot family is at stake! Will the robots be safe? 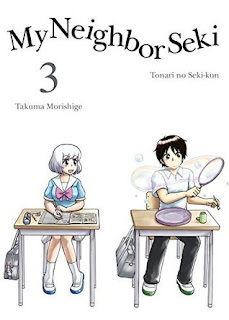 As Yokoi becomes more of an active participant, and classmates Sakura and Akiyasu get more attention, Morishige manages to take a one-joke manga for dozens of chapters without ever getting boring. My Neighbor Seki is one of the most consistently amusing manga out there, and always good for a smile. Highs: Again, it's good to see Yokoi become more involved in Seki's distractions, rather than just a passive observer. Lows: I don't really like the more...distressing actions of Seki, like the Snow Bunny chapter. Verdict: Consistent writing, the beginnings of character development, and a willingness to push the envelope makes My Neighbor Seki Volume 3 a manga that's not to be missed.